Mytagua S.L. is a company with over 25 years experience in water treatment and swimming pools. We specialize in installation, commissioning and maintenance of plant and equipment to treat all kind of waters, and our water treatment solutions are made with quality system under ISO 9001 and ISO 14001, so we always have the right technology and proven to provide the most effective response in any situation. Our services and products are designed for both the sector of Hotels and Restaurants, the Industry, Schools and Hospitals as well as privates and communities of neighbors, and our success is due to the trust our clients place in us and in our services. A loyalty we have always wanted to correspond with a professional and personalized attention from our highly qualified team, who are always available for you. Since the installation of treatment equipment for all types of water, treatments for legionella, rehabilitation and maintenance of pools, Construction of Spas and Wellness areas to selling all kinds of chemicals. In Mytagua you will find professionals who will offer the best choice for your facility. The satisfaction of a job well done encourages us to continue our line of work and of development in order to give the best service to our customers. "In Mytagua we are always on hand to advise you on your choice." Mytagua S.L. was founded in 1996 in Palma de Mallorca and from the very beginning stood as a pioneer and world leader in water treatment in general. Over time he moved to a new and larger facility in Santa Maria del Cami, where we have customer service store with display of products and equipment, administrative offices and a large warehouse to stock our products at your full provision. In Mytagua, you'll find a team of highly specialized and qualified professionals, who always will provide you a high quality service. Our studies and assessments are adapted at all times to each client and each situation to fully meet their needs, whatever, in water treatment and improve the quality of it. Also in Mytagua, you'll find quite a large selection of the best chemicals (corrosion inhibitors, scale inhibitors, biodispersants, biocides,...), accessories and spare parts for the maintenance of your pool. Products tested and guaranteed to make that your pool always looks like the first day and it gives you complete security in their cleanliness and hygiene. In Mytagua we are specialists in installation, commissioning and maintenance of platforms and equipments to treat all types of water, and our water treatment solutions are carried out under the standard Quality System ISO 9001 and ISO 14001, so we always have the latest appropriate and proven technology to provide the most effective response in any situation. 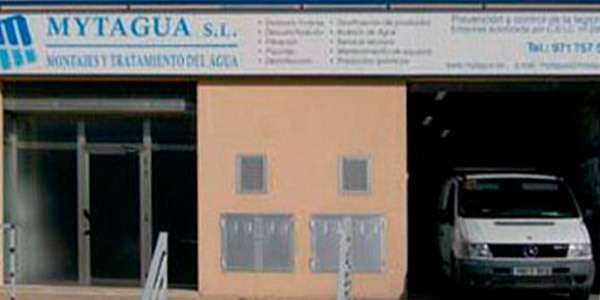 Mytagua is also a company authorized under number 9020 IB by the Health Service and Consumption Department of the Govern de les Illes Balears for treatments in facilities that may disperse the legionella and make cleaning and disinfection of such facilities according to the protocol RD 865/2003. Make environmental protection and satisfaction of our clients, the cornerstones of our business. Continuous improvement of our processes in a safe and feasible enviroment, technically and economically. Define and maintain initiatives to ensure compliance with legal requirements applicable to the activities, products and services provided by the company as well as adherence to other requirements so decided. Prevention of pollution and conservation of natural resources in all areas of development of their activities, promoting activities related to the reuse and recycling. Ensure awareness and specific training of our staff and their right to be consulted on safety. Provide the necessary means to involve business partners in understanding and acceptance of this policy. The stated policy is the result of a global consensus and a firm common will. The direction of the company leads that commitment and strongly implies the development and implementation of a management structure that allows the establishment and regular review of objectives and targets available to interested parties. We offer a maintenance service of reverse osmosis equipment, decalcifying, chlorinators, dosing ... by conducting periodic review of preventive maintenance to avoid equipment problems and breakdowns. We also do pool maintenances, that include cleanings and the necessary controls to obtain a correct state of the pool water. Reverse Osmosis Equipments adequate and suitable for both domestic use or for use in hotels and industry. We have osmosis equipments for small or large production of osmotic water, depending on the needs of each process or customer. Thus may obtain an improvement in the quality of drinking water. - Chlorine and ph automatic. We have field metering tests for water analysis directly on the premises of our customers, or in our facilities for further analysis. 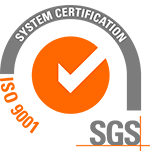 We also have an agreement for services with a specialized laboratory for more specific analysis. In construction of wellness and Spa areas, Mytagua puts all his experience serving customers, with optimum performance of all facilities. Mytagua is a company authorized under number 9020 IB by the Health Service and Consumption Department of the Govern de les Illes Balears for treatments in facilities that may disperse the legionella and make cleaning and disinfection of such facilities according to the protocol RD 865/2003.